Scott McLeod wrote a post a few months ago about 3 big shifts schools need to take. 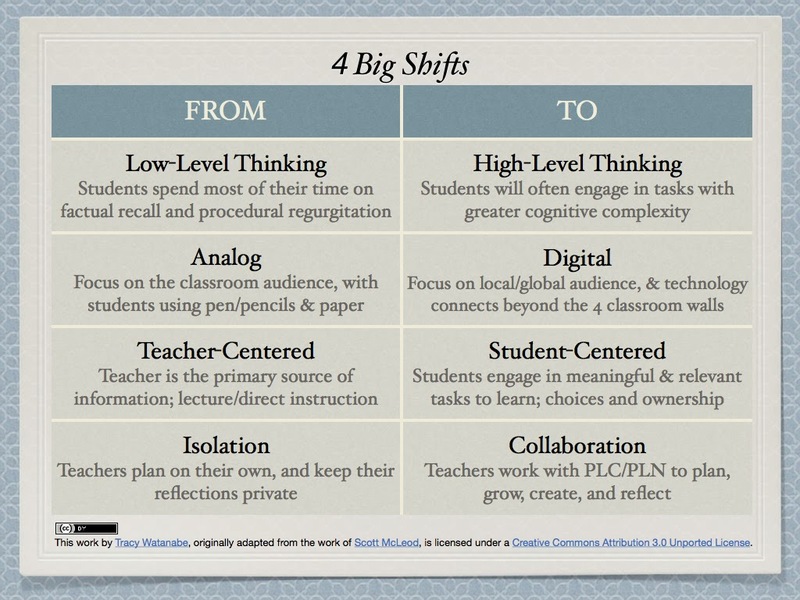 I agree with the three shifts; and want to add collaboration as a vehicle to accomplish the shifts, which is a shift in and of itself. This work, originally adapted from Scott McLeod, is licensed under a Creative Commons Attribution 3.0 Unported License. What are your daily routines, and what "quick wins" can you add/substitute in those routines to plan for Depth of Knowledge (DOK) 3 and 4 questions and tasks? I like taking the standards and thinking through questions to ask students to promote deeper thinking, and products that would prove they've truly learned the content (evidence of learning). When I collaborate with others, not only does it take less time to create these questions and tasks, but it also gives me more ideas to work with, which benefits both my learning and student learning. Therefore, I make it a priority to substitute out other conversations that do not make as much of an impact on student learning as focusing on creating questions and tasks at the various DOK Levels. In math, DOK 1 questions and tasks require students computing, which is the math I grew up with. The problem is, I could memorize the procedure for crunching numbers without conceptual understanding, and I'd never be able to apply it to my real life unless it looked like a classic worksheet problem. DOK questions are easy to assess with whiteboards, worksheets, responders (clickers), or through Google Forms because there are correct answers. Is it a good quick-check for understanding? Sure, as long as students have plenty of opportunities to focus on cognitively more complex thinking! This is where the shift in teaching and learning comes in. DOK 2 questions and tasks are about skills and concepts, so having students explain how they solve, or construct models to make their thinking visible would be a better sample of evidence of their learning. For example, have students construct a model and explain how it helps find the product of 25 and 2/3. Furthermore, students could explain with models like this LearnZillion example, and they could capture it on a screencast such as Educreations or ShowMe on an iPad; or, using Google Draw (or Paint with a PC, or Pages on a Mac), to draw out their models, and record their voice/drawing with Screenr. Strategic thinking occurs when students defend their reasoning and conclusions, which means there is more than one acceptable answer. 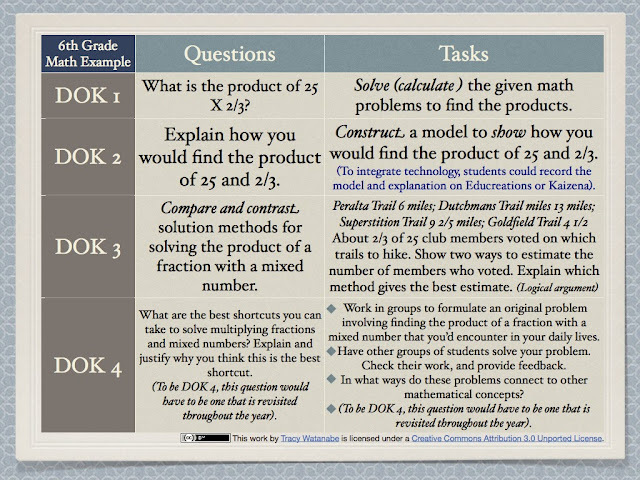 Therefore, if I have students create two different types of models to explain their thinking when solving products (still DOK 2), then could bump it up to DOK 3 by asking them to compare and contrast models as solution strategies, and defend which model they believe is a better solution strategy. 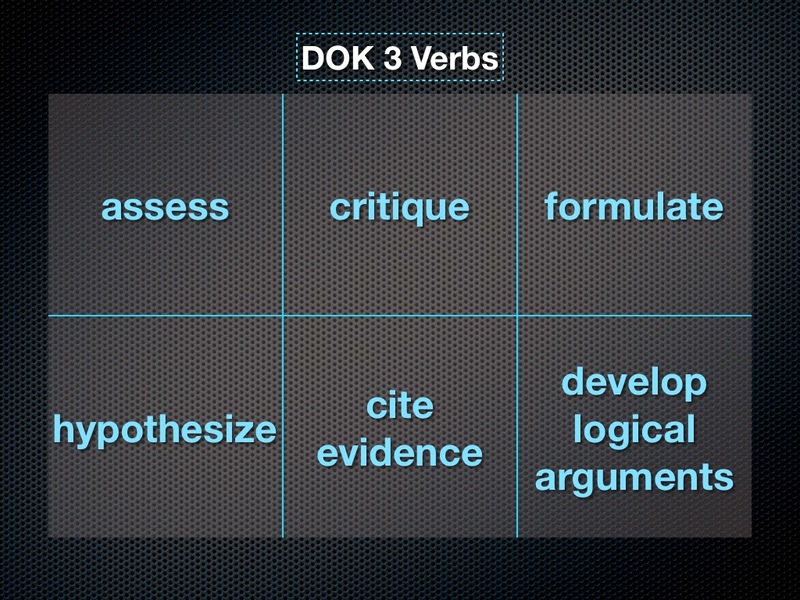 Performance tasks, which have more than one correct answer, would also be considered DOK 3 tasks. A DOK 3 question and task can become a DOK 4 question and task by returning to the big ideas over a period of extended time, or by adding complexity in thinking, which requires an extended amount of time to complete (such as Project-Based Learning). 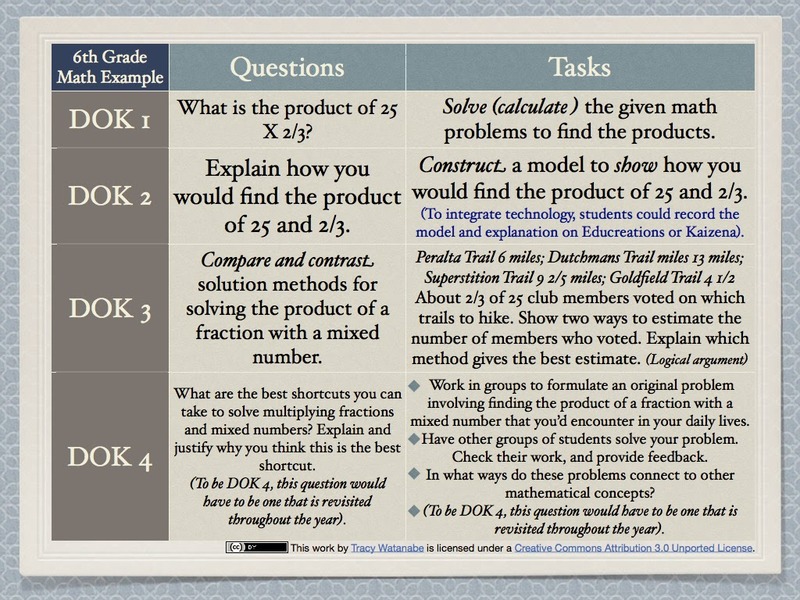 For example, in comparing and contrasting models as solution strategies, and defending which model is a better solution strategy in the DOK 3 example above; if this question is applied back to the big picture to synthesize learning, such as Karin Hess' idea to "relate mathematical or scientific concepts to other content areas, other domains, or other concepts," then it would become a DOK 4 question. Write the topic in the center of page. 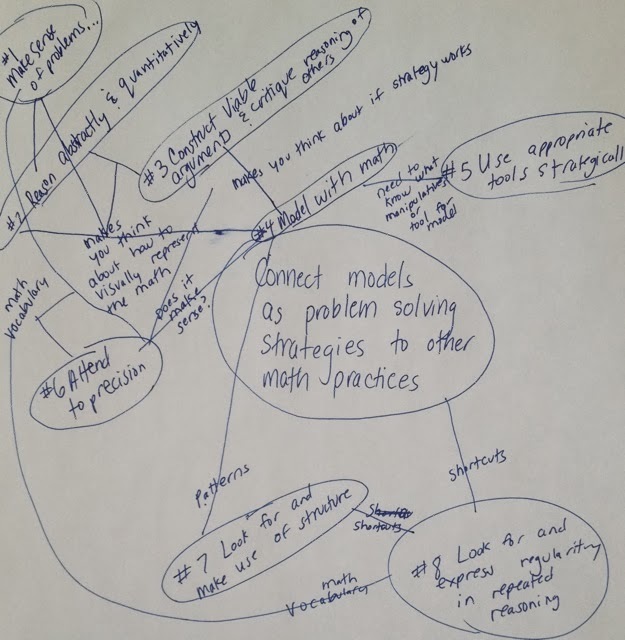 Topic: Connect models as problem solving strategies back to other mathematical practices (or back to other content areas/concepts). Generate a list of thoughts/ideas in response to the topic. Sort the ideas according to how central or tangential they are to the math practices. Place central ideas closer to the center, and tangential ideas towards the outsides. Connect ideas by drawing lines between them and write how they are connected on the lines. 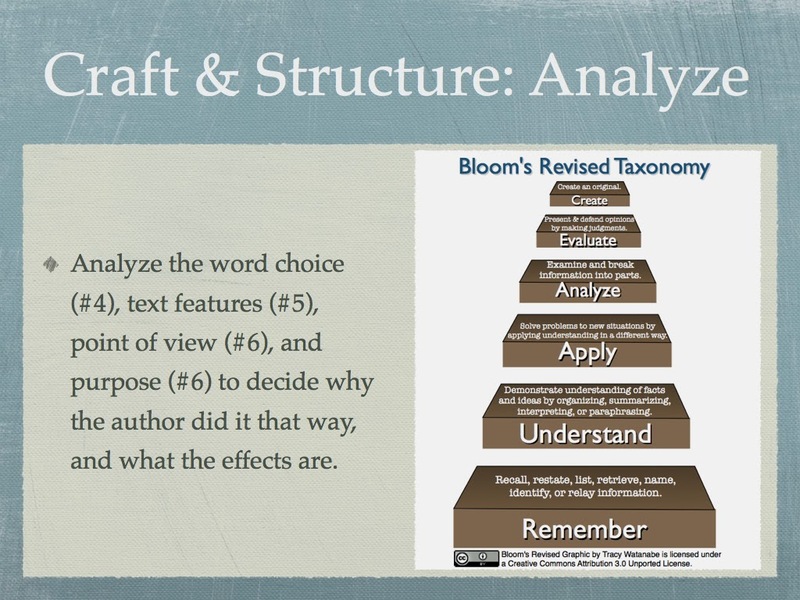 Elaborate on some of the central ideas, explaining the thinking further, which creates subcategories. Share their thinking with others. They could share with partners, other groups within the classroom, or use digital tools to share with others outside the classroom. Chalk Talk -- This silent routine builds in wait time, and differentiates learning by allowing students to make connections with big ideas and prior knowledge. Write the topic question on the white board or poster paper. Silently work in groups of 6-8 to answer the topic question. 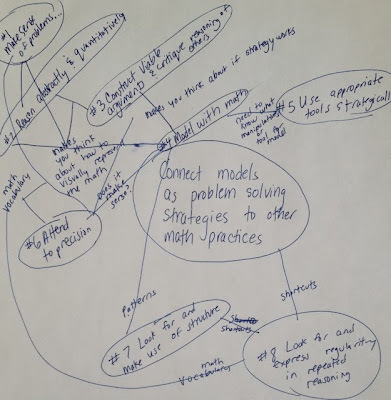 Topic question: How does using models as problem solving strategies connect back to other mathematical practices? In complete silence, write responses on the board or paper. Circle text you find interesting or compelling, and write a note explaining why. Connect ideas by drawing lines between them. If you aren't sure if they are connected, then place a question mark on the line. Circle text you have questions about and write the question next to the idea so others can respond. Debrief afterwards by viewing other Chalk Talks going on in the classroom, and share what they gained from the Chalk Talk. 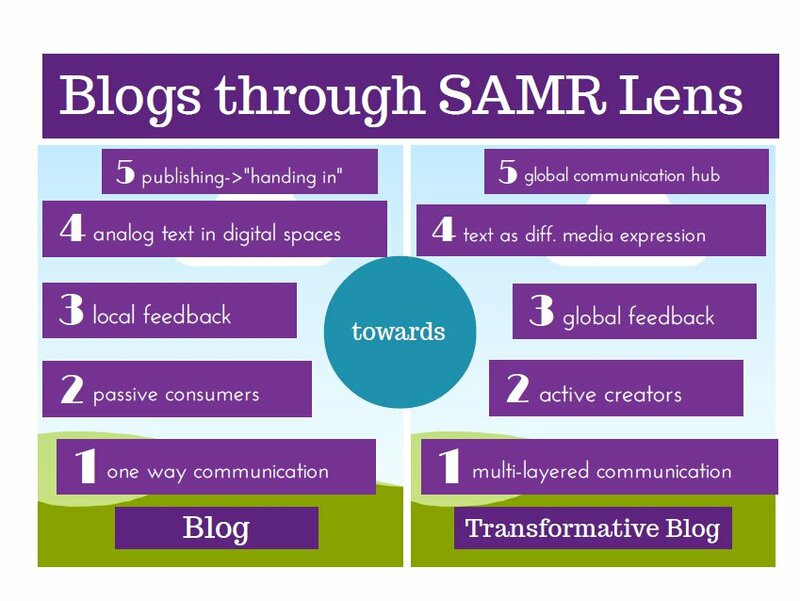 They can share with a peer in the classroom, or share beyond the classroom via digital tools. 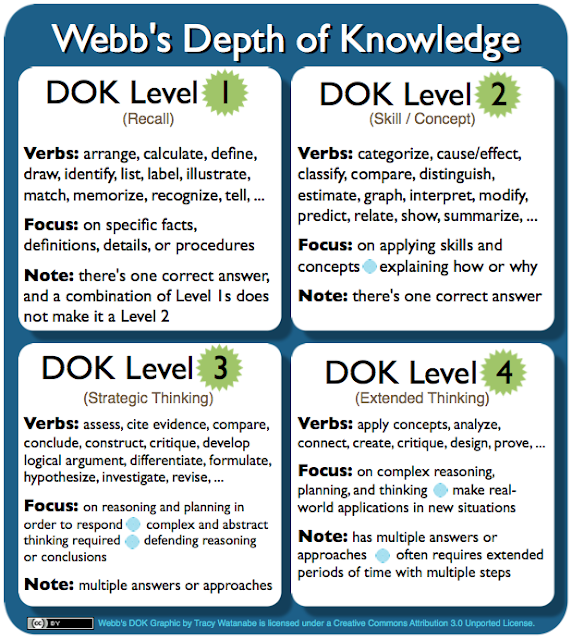 It's been my observation that teachers who have a teacher-centered classroom, also have students working with more DOK 1 and DOK 2 questions/tasks. Furthermore, when those teachers integrate technology, it's more often analog, with paper/pencil substitutions. However, it's also been my observation that teachers who collaborate to design improved lessons/questions/tasks, also have an easier time transitioning to student-centered classrooms, with more DOK 3 and 4 learning opportunities, and integrating technology, connecting beyond the four classroom walls. What correlations do you notice between the shifts needed in schools? What classroom routines would you add to promote deeper DOK? How else does this post connect with you?